Supporters of hardline Islamist group — Hefazat-e-Islam — on Friday staged protests calling for the statue of a Greek goddess installed at the Supreme Court to be destroyed or removed. The group spilled onto the streets of Purana Paltan area in the capital after Friday prayers at Baitul Mokarram mosque demanding the immediate removal of the statue. The sculpture of Themis, the blindfolded deity of justice and order, has ruffled feathers in the country since it was unveiled late last year on the premises of the Supreme Court. They chanted slogans and wielded placards with slogans such as “Demolish the statue on the court premises and replace it with the Koran”. Security in the area around Baitul Mukarram, the country’s national mosque in the capital, has been increased, said local police chief Rafiqul Islam, adding that “at least 1,000 people” were thought to have joined a rally there. Hefazat spokesman Azizul Haque Islamabadi told media that statues or honouring idols are “strongly prohibited in Islam” and accused secular forces in the country of a “conspiracy”. “We want the statue of the Greek Goddess to be removed immediately. It doesn’t reflect the Islamic culture of the Muslims of our country,” he said. However, court officials have defended the statue as “a symbol of justice”. 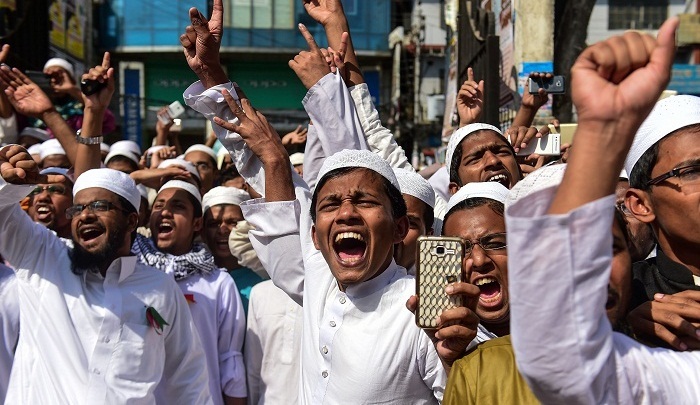 The protests come as hardline Islamists try to push a series of changes in school textbooks, which are overwhelmingly secular, to reflect Muslim traditions. Meanwhile, hundreds of protesters joined a similar rally in the country’s second largest city Chittagong, local police said.